Nestled among the beautiful rolling hills of County Roscommon the Award winning Ardcarne Garden Centre is far removed from the hustle and bustle of modern living yet just off of the N4 between Boyle and Carrick-on-Shannon. 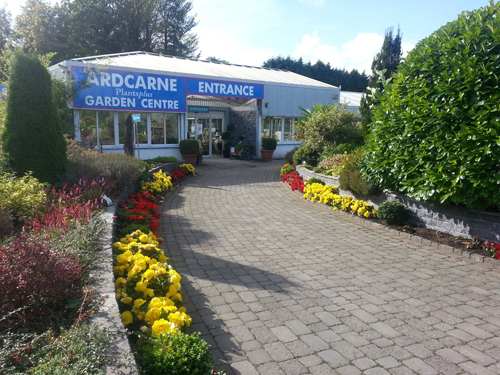 Since it first opened in 1986, Ardcarne Garden Centre has been recognised as one of Ireland's best and is a haven for enthusiastic gardeners, whether you are searching for that special plant or simply looking for advice and ideas to get you started. When you arrive at Ardcarne Garden Centre you'll enter through an extensive covered area brimming with colourful plants – so you can shop in comfort whatever the weather. The garden centre is designed for easy shopping and you can find everything you need for the garden whether you are interested in ‘growing your own’ fruit and vegetables or looking for the latest in garden furniture. Plants remain our passion here at Ardcarne Garden Centre and you will always find new and exciting plants suited to different conditions, to ensure they will thrive in your garden. We know that choosing plants can be a bit daunting if you are new to gardening, so our team of qualified and friendly staff is always on hand to offer assistance. In 1998, a second branch of Ardcarne Garden Centre opened in Roscommon Town which offers convenient shopping for all your gardening needs right in the heart of the town. 4. Full Landscaping & Design Service – Have your garden professionally designed and landscaped by our award-winning landscape service. 9. Plant Guarantee - All our hardy plants are covered by a two-year guarantee. Apart from damage by extreme winter weather – if a plant fails just bring it back with a receipt and we’ll give you a free replacement.